I thought I'd spotlight this book because my entire family loved The Percy Jackson and the Olympians books so much, and I'm really looking forward to reading this book together as well. Hopefully my kids will learn as much about Egyptian mythology as they did about Greek mythology! 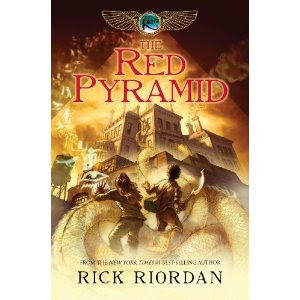 The Red Pyramid is in bookstores and on Amazon now! Let me know if you read it and if you liked it! I just got my copy in the mail today from amazon (9.99 there), but haven't had the chance to read it yet. It looks pretty good and the size... 517 pages. Thats twice the size of a Percy Jackson book. I've already been informed that i have to start reading it soon since my sister and mother wants to read it.